Maine fly tyer Ed "Muzzy" Muzeroll's atlantic salmon fly patterns belong in a class of their own. Their beauty along with the fine motor skills and material knowledge required to produce them never ceases to amaze angler and nonangler alike. Here is a shot of Ed's pattern called Treasure Island taken by Maine photographer Chris Bolduc. 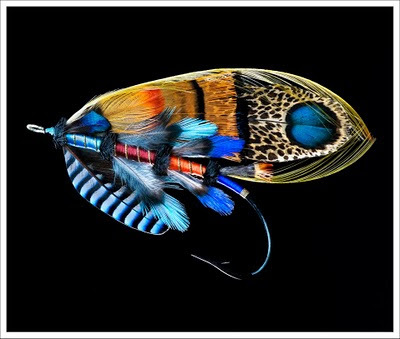 Check out this SLIDESHOW to see Chris's photo collection of Ed's flies and visit Muzzy's Flies to learn more from the master. I've purchased several very nice salmon flies from Ed. I originally contacted him through his net site which had many photos of his flies. Seems that his site is no longer functioning. Any one know what happened? I had heard a rumor that Ed was winding down operations. Maybe it's true? I'm interested in ordering a few more salmon flies from Ed, so if anyone has contact information I'd appreciate it. Thanks!